The Museum of Science and Industry’s beloved U-505 submarine has resurfaced in an amazing indoor exhibition that showcases the story of the German sub’s legendary capture in World War II and explores technology and life aboard the vessel. Mad’s founder worked with the exhibit team and was the driving force behind the way in which the U-boat is now displayed. The exhibit begins by immersing guests into the history and milestones of World War II, Hitler’s drive for control and the Battle of the Atlantic. Guests learn about the use of U-boats as a deadly tactic in keeping necessary supplies from the Allies and about the naval task groups that were formed to hunt down the German subs. Through special effects, re-enactments, archival footage of the day of capture and amazing sound effects, guests will wind through the exhibit and follow along with the story of the boat’s capture on June 4, 1944. Then comes the exciting moment when they turn a corner to first encounter the 700-ton, 252-foot U-505 “face to face.” The exterior of the sub has been completely refurbished, and with exacting research, it has been returned to its original paint colors. Dramatic lighting effects make the sub seem as if it is still prowling the depths of the Atlantic. Crack the Code: Decipher and encipher covert messages with the use of the complex Enigma code—the code by which German forces communicated in secret. Dive Trainer: Attempt to maneuver the sub through a controlled dive, while battling against dangerous depth charges! Life On Board: Guests are exposed to the sights, sounds and feel of the sub’s close quarters during wartime. On Patrol: A recreated portion of the sub’s conning tower is complete with both an attack and a navigational periscope. Using these periscopes, attempt to launch a torpedo as well as determine their vessel’s bearings and decide whether it is safe to surface. Buoyancy Challenge: Learn about buoyancy in this timed challenge with a model sub. The exhibit finishes with a stop in the Gallery/Lange Theater, where guests can see a short video that chronicles the reconciliatory 1964 meeting between Captain Daniel Gallery and Harald Lange, the German captain of the captured U-505. As guests make their way out of the exhibit, they enter the Tribute and Memorial Area, which honors the 2,200 brave members of Task Force 22.3 by name as well as the Merchant Marines, the WAVES and the German crew of the U-505. Approximately 1,000 hours were spent repairing and conserving the submarine prior to its move. 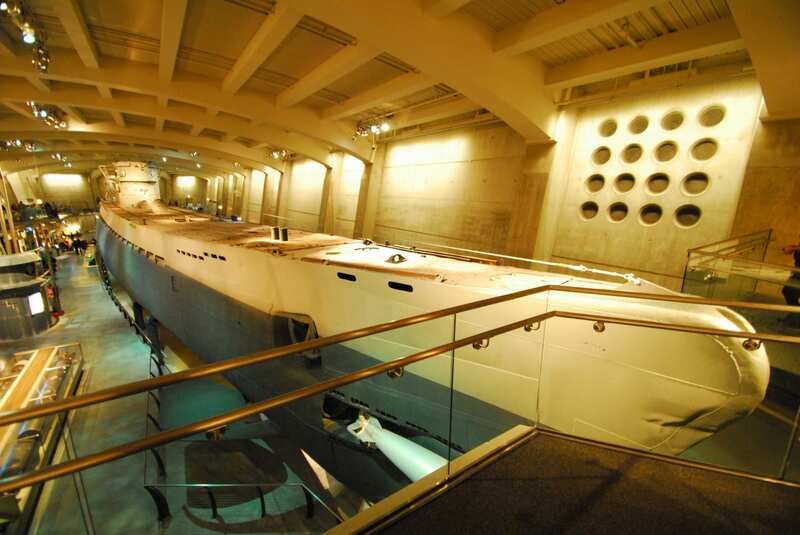 In April 2004, the boat began its complex move from the southeast side of the Museum to the northeast side of the building with the help of 18 self-powered dollies, guided by remote control, moving one inch per minute. The intricate transport of the boat was directed by NORSAR Inc., an engineering transport and lifting company that specializes in moving barges and other large industrial objects. The U-505 was moved more than 1,000 feet, over the course of several days, and had to make several 90-degree turns. It was lowered, four inches at a time, into its new home—the underground exhibit space, which measures 75 x 300 feet and 42-feet deep. want to know more about the capture of the U-505?